Sat on the beautiful Thaa Atoll, the gorgeous Maalifushi Resort is the perfect tranquil hideaway for families and couples seeking the very best in stylish Maldivian holidays. With surfing and world-class diving being at the forefront of this exotic beach retreat, the resort is ideal for all types of holiday and marine life enthusiasts, or kids and their parents after copious beach fun. With luxurious spa services from Shambhala Retreat, COMO knows what it takes to ensure complete wellbeing with eight overwater treatment rooms for male and female use plus a yoga pavilion. There is a choice of lagoon accommodation such as overwater suites and villas accessed via wooden walk-ways and featuring private terraces with direct sea access or there are garden rooms perfect for families with children. Next to all the amenities, these tropical hideaways are shaded by the resort’s lush greenery and make the ideal base for exploring the delights of the Maldives. Generous in space and ideal for families with children, these suites offer direct access to the pristine beach and feature their own private pool and sundeck for alfresco dining. At 101 square metres they are a generous space. With 116 square metres of accommodation in a fabulous setting, these elegant beach villas have a private pool and large sun terrace, with French doors opening onto the most idyllic settings. With the same facilities as the standard beach suites, these larger suites have the advantage of two separate bedrooms. The second offers twin-beds and small shower room ensuring that all the family have maximum privacy and comfort. Stunning beach villas featuring an elegant king-size room and smaller twin room offer direct access to the beach and private pool. Large windows and French doors from the bedroom to the terrace enhance the escapism guests can enjoy in this luxurious accommodation. There are two styles of this accommodation with the second bedroom attached or detached from the main villa quarters. An additional TV is located in the bedroom. A spectacular duplex beach house, this category features two generous bedrooms, a large private pool and secluded sundeck, plus a private garden. A second TV can be found in the bedroom and the beach house has an elegant finish throughout. A beautiful example of Maalifushi accommodation, this elegant beach villa offers two separate bedrooms and a study that can also be used as a single bedroom. A private lawn and swimming pool is incorporated into the design with services such as full butler assistance, additional 46” TV in the bedroom, Wi-Fi and air-conditioning. The lavish villa also offers a generous sun deck furnished to allow for alfresco dining and plenty of space alongside the pool. The COMO Residence is a contemporary display of pure indulgence with fantastic sea views, a living area, media room and full kitchen. A sundeck with loungers and dining furniture, full butler service and all of the standard facilities plus an 85” TV in the media room ensures guests of this class receive an unforgettable experience. Ideal as a special retreat for romancing couples, and as a honeymoon getaway, these fabulous water suites are stilted bungalows located to the west of the island featuring their own sun decks and private pools, and direct lagoon access. 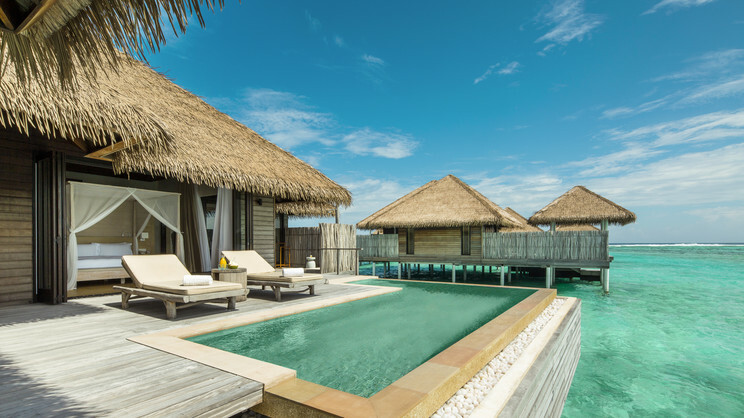 The water villas are located on their own jetty with each one featuring its own private pool, sundeck and full-length windows looking over the azure Indian Ocean. The large sitting area transforms into an additional sleeping area for the children. An opulent combination of Maldivian and COMO luxury, this spectacular Water Villa is positioned at the end of the jetty allowing for complete privacy. It features a generous sundeck and private pool and is designed as a two-bedroom over-water villa of generous proportions. The crème de la crème of Maalifushi accommodation, stunning COMO Villas sit above the beautiful aquamarine waters of the lagoon featuring two large bedrooms ideal for families and comes with its own private pool and butler service. At 408 square metres, this is an exclusive space ideal for the ultimate luxury break. A luxurious resort requires the highest level of cuisine and excellent service, and this is no less evident in the array of dining options at Maalifushi Resort. A wonderful fine dining example, Tai offers many things to all guests. From the sunken sushi bar and outdoor terrace with tables lit by candle light, guests can enjoy an exquisite array of Japanese seafood and vibrant flavours. All-day dining is the theme of Madi with influences and traditions from Maldivian classics, the Med, Indonesia and Thai accents. Relax in this stylish yet easy-going pool bar. Enjoy a game of billiards, sample wood-baked seafood and delicious pizzas in addition to a salads and a range of beverages. There is in-villa dining via room service, special event preparations and healthy options from Coco Shambhala.